Accountable Care Organizations (“ACOs”) receive a substantial portion of their revenue through shared savings programs in which payers pay the ACO a portion of total cost savings generated by member providers through effective care management. The ACOs then distribute part of the shared savings to participating healthcare providers, based on a distribution formula; the remainder is retained by the ACO to cover operating costs and generate a return for its owners. A key question for ACO leaders is whether or not the funds distributed based on the distribution formula need to be consistent with fair market value (“FMV”), and if they do, what is FMV? In October 2015, the OIG published final waivers related to the Stark Law and the Anti-Kickback Statute for specified financial arrangements involving Medicare Shared Savings Program (“MSSP”) ACOs. ACO Participation Waiver. Properly documented and authorized financial arrangements between ACO participants that are reasonably related to the purposes of the MSSP are protected from Stark and Anti-Kickback scrutiny under this waiver. According to CMS, this waiver may protect an ACO’s distribution of funds other than MSSP shared savings from challenge, assuming all of the requirements of the waiver are satisfied, including public disclosure of the financial arrangement. Shared Savings Distribution Waiver. The distribution of MSSP shared savings among ACO participants is protected from Stark and Anti-Kickback scrutiny under this waiver. This waiver does not apply to the distribution of funds earned outside of the MSSP. As a result of these waivers, distributions of MSSP shared savings, in particular, do not always need to meet the FMV standard for Stark and Anti-Kickback compliance. If an ACO elects to leave the MSSP, the ACO Participation Waiver will cease to offer protection after a six-month grace period. As a result, once no longer enrolled in the MSSP, any distributions related to commercial contracts or any other similar programs would no longer be protected by this waiver. If the ACO is a non-profit entity, the distribution formula may need to meet the FMV standard for tax compliance purposes. A third party FMV opinion can help with negotiating and structuring the distribution model. The MSSP waivers are currently untested. Those who want to assure that their provider distributions are consistent with FMV will find it challenging to determine market payments. Some ACOs report provider distributions as a percentage of shared savings revenue while others report as a percentage of profits (after operating expenses); most do not specify which. “Providers” can include both physicians and hospitals/health systems, and the split is often not reported. Some ACOs charge providers membership fees while others do not, which also does not typically get reported. With the limitations above in mind, we researched 209 ACOs that disclosed their distribution methodology to develop market benchmarks. We have presented this data on an aggregate basis. For the reasons above, this market data is not intended to be relied upon without further examination. The distribution formulas in our study range from 100% allocated to providers to 100% retained by the ACO. The average provider distribution percentage reported in 2016 was 65.7%; and the 25th and 75th percentiles were 50.0% and 81.6%, respectively. 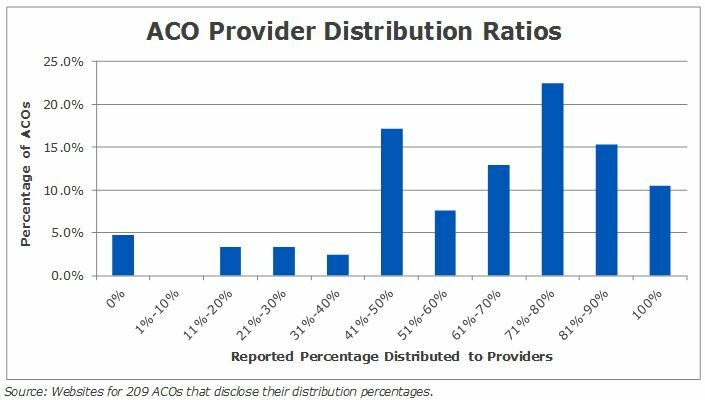 The figure below presents the distribution percentages of the ACOs in our study in 10% increments. An ACO that is 100% physician-owned may not have a provider distribution policy and may choose to divide 100% of the profits pro rata based on ownership. An ACO that collects membership dues equal to the ACO’s budgeted operating expenses may comfortably allocate 100% of shared savings to the participants. An ACO that has struggled historically or foresees having difficulty exceeding its financial forecasts may need to retain a higher percentage of profits to secure its financial position. An ACO with a higher cost structure (e.g. a plethora of outsourced services and significant ongoing information technology expenses) may need to retain a higher percentage of profits. Waiver qualification: Since distribution payments by these ACOs largely fall under the fraud and abuse law waivers, some ACOs likely distribute shared savings without considering FMV. For these reasons, ACOs wanting a distribution formula that meets the FMV standard must take care to draw comparisons to the distribution methodology used by ACOs with characteristics sufficiently comparable to their own.